Usually WordPress themes nowadays make use of featured images to display thumbnails on various locations within your WordPress theme, like archives, within widgets or inside the post content. In case you’re running websites with lots of videos, you might want to automatically add video thumbnails as featured image for a better workflow when creating your content. In this tutorial we’ll cover how you can make use of featured images while handling your video content in WordPress. Wouldn’t it be great if you could have automatic video thumbnails as featured image so that you don’t need to create and upload featured images manually? Well, luckily there are plugin developers who had the same idea and there are various WordPress plugins that can do just that and more. Video Thumbnails for example is a plugin that will find the first video embedded within your content and retrieve thumbnails for you. These thumbnails will be saved within your media library and automatically set as featured image so that you don’t need to do this manually anymore. While the Video Thumbnails plugin sets regular featured images for your posts that contain a video, there also are more sophisticated solutions as well. The Featured Video Plus plugin goes one step further and will not set featured images, but instead will replace the featured image with the video itself. That means on your website where usually the featured images would have been displayed, there now will be the video, ready to be watched by your website visitors. However, please keep in mind that while it’s great to display videos instead of featured images and provide your audience a way to easily watch these videos, this also can have some disadvantages. The most importent aspect that needs to be considered is the performance of your website! Displaying lots of videos instead of featured images on your WordPress website (e.g. on archives) can have a negative performance impact and heavily slow-down your website. So that’s definitely something you should keep in mind while working with plugins like this. In addition, when you already display the video content instead of the featured image on archives and within widgets, your audience doesn’t necessarily need to access your post content anymore to watch the video. That means there is a chance that many people won’t read your additional post content anymore and this also can have negative effects on the bounce rate of your website and reduce page impressions, which usually isn’t that great for ad revenue. You see, there are several ways of working with video content on your website instead of displaying featured images which you’ve manually uploaded within WordPress. While the first approach will simply replace the featured images with video thumbnails, the other solution will display the video content itself instead of featured images. Each way has its own benefits and disadvantages and you can choose whatever suits your personal requirements. But these were only two examples of plugins for this purpose and you’ll find more within the official WordPress plugin directory. 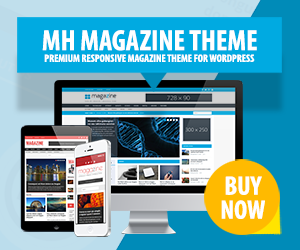 MH Magazine is a very awesome theme. However, I have some issues related to featured images. Most of my posts are videos, and I have a hard time looking for featured images that look like the video that I’ve posted. Instead I am looking for something that auto creates thumbnails from the video. How can I use video thumbnails in WordPress? Hi Ashenafi, thanks, we’re very happy that you like MH Magazine. In order to achieve what you want you could make use of plugins like Video Thumbnails as mentioned in the article. That plugin should be able to auto-generate thumbnails from your videos and set them as featured image. In case you have questions regarding your theme itself, please send a support request through your MH Themes account and our support staff will be more than happy to assist. Can the main image in the MH Newsdesk WordPress theme be a video and not a picture? Hi Bill, in general the theme makes use of features images as this is standard. But if you want to replace featured images with videos, you could have a look at the Featured Video Plus plugin that has been mentioned in the article. Hi, I see that some websites use a video-category to show a list of videos. I would like to know how I can insert this feature in my website. I would have a page, different from other pages, where I can publish some video interviews. Hi, I tried the Featured Video Plus plugin, but I only get it to work on the widgets. It doesn’t replace the featured image in the post. What could be the problem? Hi, we haven’t developed the Featured Video Plus plugin. You could reach out to the plugin developers for further analysis and support.